We designed the Helios 3D fly rod to cast at impressive distances without sacrificing power — and it hits the mark every time. We've reduced the variables at the point of release to focus the energy behind every cast. Increased hoop strength means reduced vibration for a crisp release every time, because we know accuracy is paramount. The H3D rod churns out precise casts that are the stuff of legend — because it's the pinpoint delivery of flies that takes you from a quiet day on the water to battling predator fish ripping down the flats. Pushing through a gusty saltwater wind is no big deal — the Helios 3D has the power to get your fly there, and the accuracy to drop it right where you want it. Whatever the location, whatever the fish, the H3D is ready for it: big rivers or saltwater, bonefish or bass — those accurate drops earn more bends in the rod, it's as simple as that. 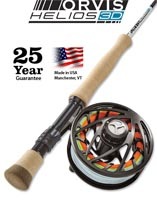 Get the most accurate fly rod in existence and land more fish on every trip. Incredible power, deadly accuracy, and impressive feel are part and parcel of our Helios 3F fly rods. Not only have we built a super lightweight rod in the Helios 3, but it also offers a crisp feel in hand for an unbeatable casting experience. Accuracy is important. Hurling a fly across the water and hoping for a strike won't win any trophies — it's those accurate drops that bring in the real prize. The difference of a couple of inches can make or break a catch. The Helios 3F reduces the variables and harnesses the energy behind each cast for enhanced accuracy, so you can reach the far bank and drop a fly with precision every time. We've checked unbeatable accuracy and power off the list, but the H3F also delivers the finesse required to delicately drop a fly without spooking fish, and it has plenty of backbone to haul in the big fish of your dreams without flinching. Whether you're chasing bonefish on the flats or casting streamers to the far bank, the Helios 3F offers the outstanding casting performance and responsiveness you need to land more fish. 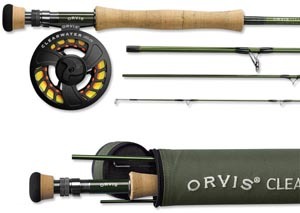 The new Orvis Recon combines a high-performance, fast action feel with light swing weight. With close-in loading prowess and the power for longer reach, Recon rods boast a completely new ferrule design, a modern shadow green blank, and covert black nickel hardware and reel seats. 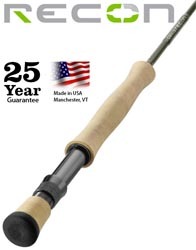 Proudly made in Manchester, Vermont, and complete with aluminum rod tube, cloth rod sock and 25-year guarantee. Strong enough to stand up to even the roughest conditions and toughest fish, but light enough to cast all day, it's perfect for when you need to punch flies into the wind and turn over bulky flies, all without wearing out your arm. Swirling stripers and shimmering steelhead don't stand a chance against its power, smooth action, and fish-turning ability. Travel-ready, the Frequent Flyer™ fly rod packs right into your backpack, saddlebag, even your briefcase. 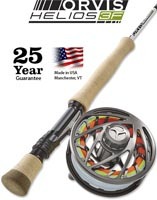 This fly rod is so great to travel with. Carry the fly rod onto any plane to forever end any and all worry about your fly rod making it to your final fishing destination. Keep it right in your vehicle, out of the way, for quick fishing getaways at lunch, or pack it into the backcountry far easier than even a four-piece fly rod. The Encounter rod series combines state-of-the-art rod design with a smooth, crisp performance—packaged with a large arbor Encounter reel, weight-forward floating line, backing, and leader.